"What makes a Hershey's Bar pure?" asks their latest commercial. It certainly isn't the chocolate. According to this most excellent post by Cybele at Candyblog, Hershey's has slowly been degrading the quality of the chocolate in their products over the past few years. Back in 2006, they started using the emulsifier and extender PGPR on several of their products, and last year they finally expanded the practice to include their trademark milk chocolate bar. So if you've been wondering why your Kisses and your Mr. Goodbars and your Krackels just don't taste the same anymore, it's not you. They aren't the same. They aren't exactly chocolate anymore. INGREDIENTS: MILK CHOCOLATE (SUGAR; MILK; CHOCOLATE; COCOA BUTTER; LACTOSE; MILK FAT; SOY LECITHIN; PGPR; EMULSIFIER; VANILLIN; ARTIFICIAL FLAVOR). 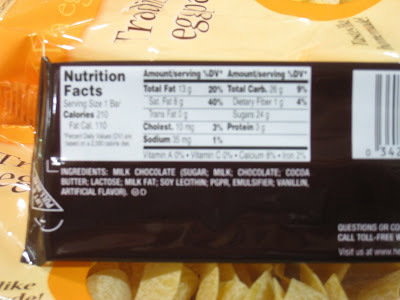 A part of the proposed changes in the Citizens Petition presented by the Grocery Manufacturers Association to the FDA is a change in the strict Federal "Standards of Identity" for chocolate products which would permit the use of cheaper vegetable fats instead of the traditional cocoa butter and lower-cost milk substitutes instead of genuine milk products. This change would permit the resulting products to still be called "chocolate." Luckily, they were not successful, so a product still has to have some cocoa butter in order to be called chocolate. It doesn't, however, have to be 100% cocoa butter, apparently, as evidenced by the current Hershey's Milk Chocolate Bar. So, what does make a Hershey's Bar Pure? Why, "pure gooey goodness", of course. You don't still think the answer is "chocolate," do you? Yes, isn't it, Carolyn? What's really sad is how little difference it seems to have made to most people. I think people are so used to things not being what they say they are that they just don't care anymore. It is always more astounding when something is genuine than when it is a bunch of weird, non-food-sounding crap. thank u for exposing this corporate crap that they're trying to pass off... where'd u go, joe dimaggio? I guess Joltin' Joe has left and gone away, lawdwarren. While I agree with what you say, Misreall, it makes me really sad. Maybe there's a way to get people to care more, but I have yet to figure it out. It is sad, Usha. 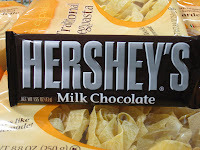 I thought certain things were sacred, and Hershey's chocolate was one of them. It has taught me to look at the label of every single item before I buy it now, even brands I think I know. Like Michael Pollan said, the foods that most people eat these days would not be recognized by their grandparents. And while most things are probably ok in moderation, I can't believe it does anyone any good to be putting so many synthetic materials into our bodies. At least it doesn't have hydrogenated oils in it, like some chocoltae products do. That may be true, Tsaritsa, but that doesn't make it any more chocolate, nor does it make me any more inclined to eat it. Your use of the phrase "chocolate products" sums it up. Whatever it is, it is no longer chocolate. It is a chocolate product masquerading as chocolate.